Impact investing, a term that’s become increasingly buzzy in recent years, can be used to describe a broad range of investments made in corporations, funds, and organizations that seek a financial and social return. Impact investing in the for-profit and nonprofit spheres has grown exponentially in the last decade. Consequently, there have been discussions in academic circles, the financial realm, and the charitable sector about what this rapid movement toward impact investing means for the future of charities. Maybe you’re asking yourself, “Am I an impact investor?”, or “Do I want to be an impact investor?”, or “Does any of this really matter?”. My guess is that most of you reading this, like me, do not have an advanced degree in finance or economics. Perhaps you’ve heard the term “impact investing” but your understanding of the practice stops there. Let’s take a few moments to explore impact investing, and understand what tools and resources are available to help donors, of all sizes, make more informed and impactful giving decisions. We’ll use a new study by the Women’s Philanthropy Institute (WPI) at the Indiana University Lilly Family School of Philanthropy entitled “How Women and Men Approach Impact Investing” to gain a better understanding of this subject. Does the broad (and vague) definition of impact investing in the first paragraph of this post still have you confused? You’re not alone. Unfortunately, there is no standard definition for impact investing. According to WPI’s study, “One reason the impact investing landscape may be less well understood is that there is no legal definition for the term and no specific tax treatment for these investments…” The study goes on to provide two similar but slightly different definitions for the term, including the one mentioned at the top of this post. To keep things simple, impact investing, at any level, aims to marry a financial return with a social or impact. Individual investments fall along a spectrum with a focus on the financial return on one end to a focus on the social impact on the other. So, who’s an impact investor? According to the study, “Anyone can participate in impact investing -- corporations, foundations, or individuals...” It finds that Millennials are more interested in impact investing than older donors, and women are more curious about the practice than men. A term like “impact investing” conjures up images of stodgy bankers and young tech entrepreneurs. But, that doesn’t exclude “Average Joe donors” from making impactful investments, or donations, to improve the world around them. Keep reading to learn more about some of the tools and resources to donors. What resources are available to help donors make more informed and impactful giving decisions? Charity Navigator is a free resource for donors of all sizes. Our two-dimensional charity evaluations consider charities’ financial health and accountability and transparency (or governance) practices to help donors understand how their contributions will be used. Our ratings offer a clear picture of how charities are allocating their funds, what policies they have in place to safeguard against fraud or malicious activities, and what they are doing to communicate their results with their constituents and supporters. In November 2017, we partnered with Classy, GlobalGiving, and GuideStar to launch an impact reporting initiative. We use data and collected by our partners to provide donors with more information about charities’ measurable impacts, like how many constituents were served in a given year and what outcomes were achieved. 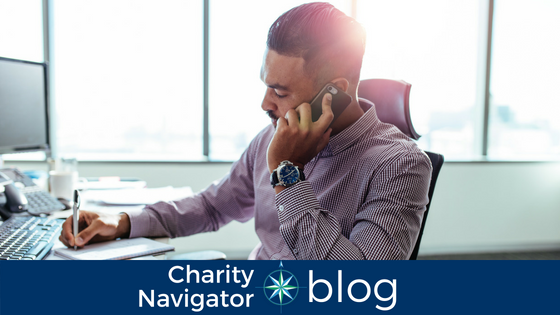 In addition to our charity ratings and impact reports, Charity Navigator offers a number of other tools and resources to help donors make more informed and impactful giving decisions. Our Advanced Search Tool and Discover feature are great for exploring and finding new charities to support. Our Top 10 lists and Hot Topics are curated lists of highly-rated charities working on a specific cause or issue. And, our Tips for Donors pages offer advice on how to donate more confidently and effectively, and build lasting relationships with charities. We encourage you to spend some time exploring www.charitynavigator.org. Let us know what you think, and don’t hesitate to reach out to our team with questions! We’re always here to help. Want to learn more about impact investing? The WPI’s study referenced in this post is an excellent resource. You can access the full study here.